Location: Located on the east bank of the Afon Lliedi adjacent to North Dock. Carmarthenshire Dock was built c1799 by the local industrialist Alexander Raby as a shipping point for his coal and iron. A tramroad was built from the canal to Raby's furnace at Cwmddyche at the same time. In 1802 the Act was passed for the 'Carmarthenshire Railway or Tramroad' to be built from the dock to limestone quarries west of Llandybie. The tramroad was opened in 1803, making it by a few weeks the earliest autonomous public railway in Britain. The engineer was James Barnes, who was also responsible for the company's reconstruction of Carmarthenshire Dock in 1804-6 which included constructing a new quay on the west bank of the river, a connecting wall to the east quay, and later a weir and reservoir. The dock remained busy throughout the nineteenth century. A patent slip for raising large vessels was built in the eastern quay by E W Jobling, shipbuilder, in 1845. The dock continues to be used to moor small boats. A well constructed stone quay built c1799 and altered in 1845 to construct a slipway. 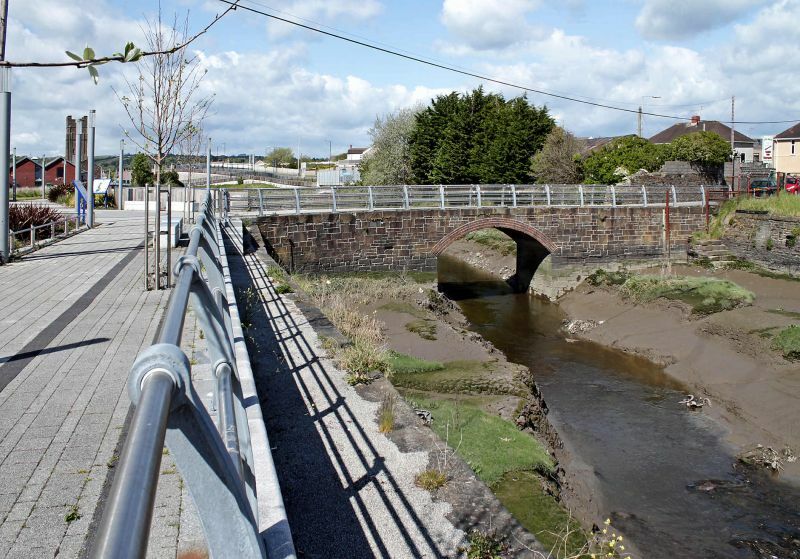 The quay is straight from its northern end at the former tramroad bridge and extends for some 120m roughly southwards. It is crossed near its southern end by a modern road bridge. It is constructed of coursed rubble sandstone with large sandstone copings. The wall is approximately 6m high from the current silt level in the Afon Lliedi at its northern end, and after a short level section slopes steeply to form the slipway. The quay has been raised above most of the slipway in concrete, but the original wall is clearly visible. It is thought to be tied to a concealed stone dock floor. A set of stone steps at its northern end descends through the wall and turns at a right angle projecting parallel with it to the silt level. Listed as an important surviving structure from Llanelli's early industrial development, and linked the first public railway opened in Britain. Located over the Afon Lliedi at the head of Carmarthenshire Dock.